It’s to be seriously hoped that Theresa May doesn’t get the landslide victory on 8 June that was initially predicted – and which she clearly aimed for in calling a snap general election on 18 April. As discussed in 8 June: Time for a Change!, she clearly thought she would be able to crush a weak and ineffectual opposition. To her chagrin though, Jeremy Corbyn, a veteran speaker at public rallies, has proved a robust and highly effective on-the-stump campaigner. Although greatly under-reported in the largely right-wing dominated mainstream media, he has consistently pulled crowds in their thousands to his campaign events. In spite of the under-reporting, there has been enough grassroots and social media activity to get at least some wider attention to them. Slowly but surely Labour have closed the gap on the Tories in the opinion polls. Whether they can close it enough by 8 June – assuming, of course, that the polls are reasonably accurate – is a different matter. The third factor in all of this is the push on a number of fronts for people to vote tactically to unseat sitting Tory MPs and to prevent the Conservatives gaining new seats. In this context tactical voting is when all the other party candidates stand down but for the one most likely to score the highest number of votes against the Conservative and they and their supporters vote for that one remaining candidate standing against the Tory. A number of websites, such as Unite Against The Tories and Vote for Europe, have been set up to guide people in how to vote tactically while Green Party co-leader Caroline Lucas has called for a ‘progressive alliance’ to oust the Tories. However, the efforts are dysfunctionally dis-coordinated. Both Corbyn and Liberal Democrat leader Tim Farron have formally rejected Lucas’ call. On the ground, though, in some constituencies, Greens have stood aside in favour of Lib Dem candidates and the Lib Dem candidate for Lucas’ Brighton seat has stood aside in support of her campaign. There are even reports of Green/Lib Dem/Labour attempts at cooperation in a few constituencies! However, in many constituencies, Green, Lib Dem and Labour candidates are still standing against each other as well as the Tory. The big divide amongst the would-be tactical voters, though, is Brexit. Although Corbyn claims to want a much softer Brexit than May seems to, he appears uncompromising in his determination to go through with Brexit. Tbe Greens and the Lib Dems are both anti-Brexit, making cooperation with Labour a difficult issue to negotiate – even if the will to do it was there. The Greens appear to have achieved a slightly higher profile this election and may even gain a second seat; but the Lib Dems seem to be doing very poorly indeed. Below 10% in most polls, despite their overt and unashamed anti-Brexit stance, they appear largely to have failed to impress voters. Given that 48% of the voting electorate wanted to stay in the European Union, the Lib Dems should be doing much better at this stage. Consequently some who would prefer to vote Lib Dem may fall prey to the ‘wasted vote’ meme and vote Labour just out of opposition to the Conservatives. Nonetheless, tactical voting will occur in some constituencies and some additional Conservative scalps may be taken as a consequence – but increasingly the election looks like developing into the usual ‘2-horse race’. A strong May government would be wrong for Britain – and so would a strong Corbyn government! There appear to have been some most remarkable changes in Theresa May’s public character over the past month or so. Gone is the wobbly woman who could only bleat “Brexit means Brexit” when asked what leaving the European Union would entail – the woman who seemed to be in hock to the ultra-Brexiteers like Boris Johnson and David Davis. Long gone is the BLUE-dominated overly-cautious home secretary who achieved financial efficiencies (and little else!) Even the RED/BLUE zealotry of carrying out the (supposed) “will of the British people” seems to have quietened down a little. Now we have a would-be ‘supreme leader’, driven by RED self-aggrandisement. Only she knows what to do: only she can deliver the ‘best deal’ on Brexit – though no deal is better than a bad deal! – and only she can make Britain safe from the terrorists – though she’s slashed the police and security forces. 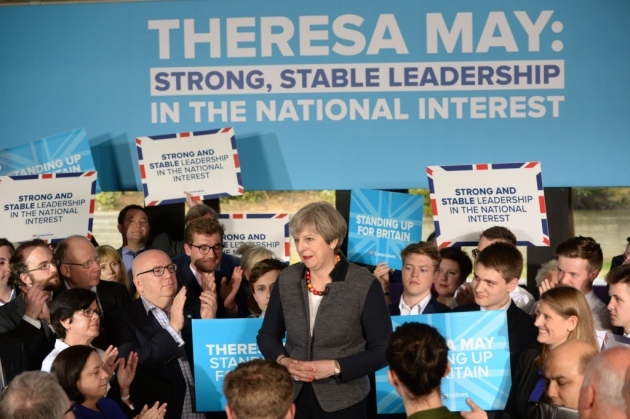 What we have seen emerge since the election was called is an attempt to develop a Theresa May personality cult. Her campaigning events promote her, not the Conservatives. 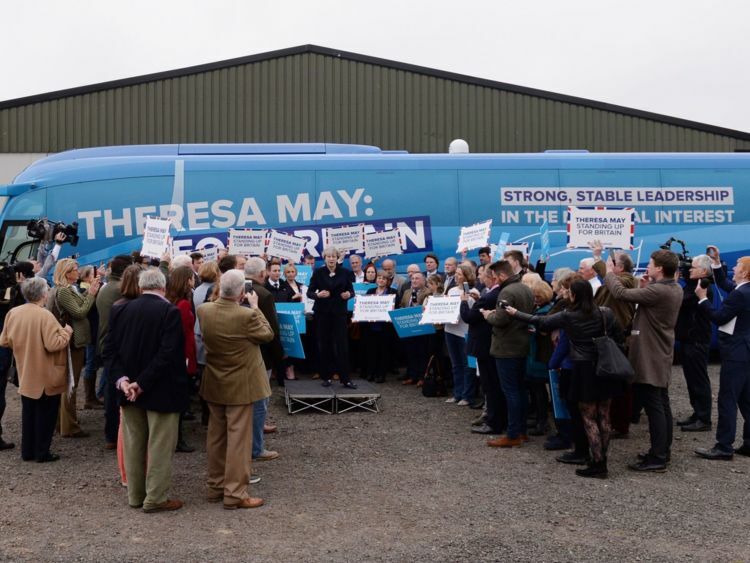 Her ‘battle bus’ and all the party’s promotional material have her name and her mantra of “strong, stable leadership in the national interest” prominently displayed. The word, ‘Conservatives’, is usually tucked away in a corner, hardly noticeable. When talking about what the Government will do were the Tories to be reelected, May all too often uses “I” rather than “We”. I’m almost tempted to think May could be suffering from Narcissistic Personality Disorder. The Mayo Clinic (2014) describe the condition thus: “f you have narcissistic personality disorder, you may come across as conceited, boastful or pretentious. You often monopolize conversations. You may belittle or look down on people you perceive as inferior. You may feel a sense of entitlement — and when you don’t receive special treatment, you may become impatient or angry … At the same time, you have trouble handling anything that may be perceived as criticism.” This last aspect of the disorder may help explain why May has refused to appear in any head-to-head TV debates with Corbyn or any of the other party leaders. Another example of May not listening is representatives from the Greater Manchester Police Force pleading with the then-home secretary at the 2015 Police Federation Conference to be aware of the deleterious effects her cuts were having on the force’s ability to protect their citizens. The video below of one of their representatives pleading with May has gone viral in the aftermath of the Manchester bombing. If May were to achieve a landslide victory, it would effectively enshrine as prime minister a woman who seems to see herself in the role of supreme leader, believing that only she knows what to do. Ruthless, determined and determined not to listen to anyone else, she would probably be as close to a dictator as a parliamentary democracy would allow. Although he is unlikely to achieve anything like a landslide victory, a strong Corbyn government could also be rather bad for the country. Taxing the transnational corporations (TNCs) and their senior executives to pay for the huge programme of investment Labour is proposing is a bit of a pipedream. Firstly, the TNCs are extremely good at avoiding paying their due corporation tax and will often simply relocate their profit centres to less punitive tax regimes. An example of this, noted in 2016 by a number of commentators such as The Independent’s Samuel Osborne, is Microsoft funnelling £8BN of UK sales through Ireland (tax rate: 12.5%) to save itself £100M in UK corporation tax (rate: 20%). The European Commission is looking into collective action to prevent this kind of tax avoidance…but, of course, Corbyn doesn’t want the UK to be part of the EU! Corbyn, along with shadow Brexit secretary Keir Starmer, is also naive in his approach to the EU. Corbyn’s talk of a ‘free trade deal’ with access to the Single Market is simply incompatible with his talk of ‘managed migration’ so long as Angela Merkel insists that freedom of movement cannot be separated out from access to the Single Market. The Commission and EU leaders such as Merkel have stated repeatedly that the UK will not be allowed to cherry pick which aspects of the EU it wants and which it doesn’t. So a strong May government – still probable but thankfully less so – would be positively toxic for the UK and would lead not only to a likely major economic recession and the likely breakaway of Scotland but a severe diminution of Democracy and rUK’s place in the world. A strong Corbyn government – highly unlikely but not impossible – may well produce a sense of change for the country and the feeling that we can become a fairer and more equitable society. However, that would be relatively short-term as confusion over the EU and how to stimulate economic growth came to dominate a Labour government. It would be far better if tactical voting produced a hung Parliament on 9 June, with no one party able to form a government. 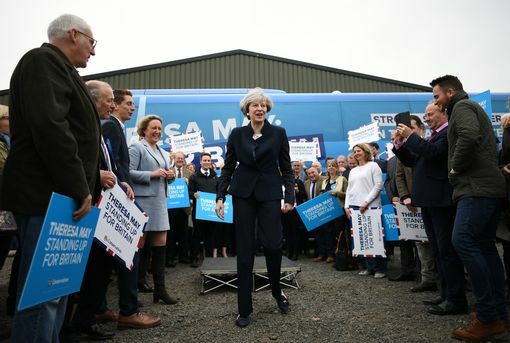 For the Tories, that would almost certainly be the end of May – not that there seems to be any viable contender to take her place other than one of the ultra-Brexiteers. (Appointment of one of them would be a real indicator the Conservative Party wasn’t learning lessons.) 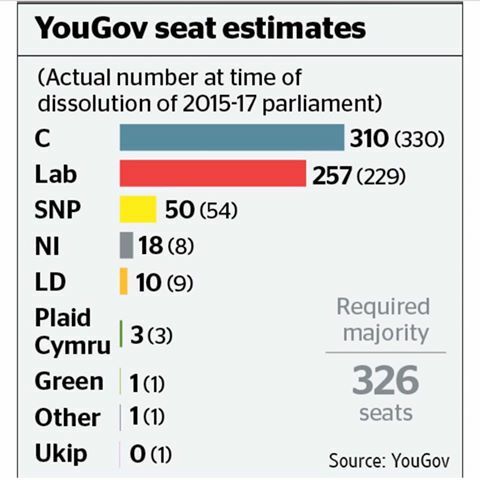 Short of losing more than 30 seats, Corbyn’s position is fairly well-assured. However, dependence on forming a coalition to govern – with one or more of the Scottish National Party, the Greens, the Lib Dems or Plaid Cymru – would force Corbyn and Labour into developing coalition policies. Hopefully, the policies that eventually emerged would be more viable economically and more realistic about what might be achieved in negotiations with the EU. A hung Parliament would also delay the start of exit negotiations with the EU and lead to increased pressure with regard to completing the negotiations by the deadline of March 2019. However, that period could also be a time of reflection on what sort of United Kingdom we want to emerge from the mess we’re in. The 2014 referendum, although it did produce a significant majority to remain, that majority was not overwhelming and it left a sizeable minority only too ready to try again. Though declining oil revenues make Scotland more economically dependent on rUK than in decades, Brexit provides the pivot on which a second referendum can be justified. Nicola Sturgeon, under pressure from the radicals in the SNP, has pressed the ‘Start’ button in the process to establish a second referendum. Unfortunately, she is between the proverbial ‘rock and a hard place’ as to when the second referendum should take place. Scotland needs time to restructure and develop a post-oil economy; during that time it will be dependent financially on rUK. If Sturgeon triggers a second referendum too soon, Scotland will not be ready economically. However, if she waits too long and, as so many economists predict, the UK goes into a lengthy recession and permanent economic damage results, then Scotland will almost certainly go down with rUK. Just when some Post-Modernists were speculating whether the concept of social class was still relevant, the EU referendum exposed England & Wales to be bitterly split along class lines. The old traditional white working class, their jobs largely gone in the New International Division of Labour, were all too easily manipulated by the right-wing anti-EU media into voting Leave while the middle classes, who in many ways enjoyed the benefits of globalisation, for the most part voted Remain. There is real bitterness on both sides of the Brexit debate and, to a very large extent, the bitterness runs alongside class lines. Almost 20 years after the Good Friday Agreement, Northern Ireland is still a place where PURPLE tribalism REALLY matters. Your family name, your accent, where you live, the school you go to, the choice of pub and other places of entertainment, and even your place of work are still all linked to some extent with the tribe(s) to which you belong and whether you are a Catholic Nationalist or a Protestant Unionist. As discussed in Leave Gerry Adams alone!, the peace in Northern Ireland is still fragile and the kind of ‘no deal’ hard Brexit Theresa May is threatening could severely undermine the peace process and undo the accomplishments of the past 19 years. A ‘no deal’ hard Brexit, involving leaving the Customs Union, would require a hard border to be reimposed between North and South, disrupting the daily border crossings of thousands of people. Moreover, as a number of informed commentators have protested – including former Northern Ireland secretary Peter Hain in The Guardian – border crossing posts would be easy targets for dissidents from both sides. Attacks on border posts could easily fuel a resumption of sectarian violence in such a tribally-divided society. 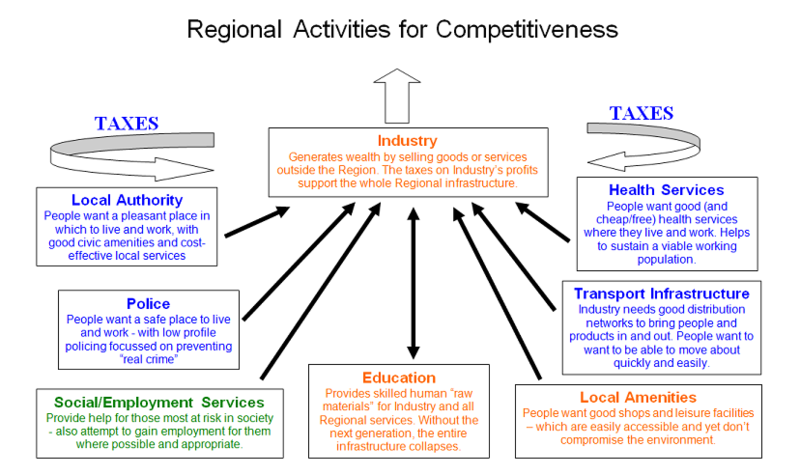 As discussed in Underclass: the Excreta of Capitalism, unfettered Capitalism simply throws people on the scrapheap when, in their search for ways to maximise profit, the TNCs relocate production of goods and services to other countries where they can pay substantially lower wages or they reduce their workforces altogether through automation and artificial intelligence. The result is huge numbers of people made redundant and forced to live off benefits and/or menial jobs. While there is strong evidence – eg: Paul Sissons, 2o11 – that this trend is now biting into the middle classes, it has decimated large areas of the traditional white working classes. PURPLE’s tribalistic tendencies and its othering of those not-of-its-tribe makes it vulnerable to scapegoating – particularly of immigrants – when exploited by the liked of the Daily Mail and The Sun. With few, if any, work prospects, low incomes and little sense of purpose, it is little surprise that the numbers of the Underclass are swelling year upon year. As discussed in Islamification: Europe’s Challenge, hardly any politicians – other than those on the hard right – are facing up to the enormous changes and challenges our fast-growing Muslim populations are going to bring to British society (and the rest of Western Europe). There are many benefits a greater Islamic influence can bring to our society as well as challenges – and, in some cases, threats. Yet Muslim men are too easily caricatured (again by the Mail, The Sun, etc) as paedophiles and/or terrorists while Muslim women are stereotyped as suppressed and abused. When Muslim leaders speak out against terrorists and paedophiles, they are often ignored or given little space in the mainstream right-wing dominated media – see Why is the West ignoring a Leading Moderate Muslim? Undoubtedly, it helps sell papers and advertising and keeps stories exposing the wealth and manipulative tactics of the 1% off the front pages if the ‘Muslim bogeyman’ is dragged out time and time again. Unfortunately, this blatant discriminatory othering by the right-wing media actually helps terrorists radicalise some young Muslims who feel shut out of and excluded from mainstream society by this caricaturing. If we, as a society, fail to address these and other faultlines fracturing our social cohesion, we risk geographical break-up, greater poverty and inequality, increased crime and racial/ethnic/sectarian violence. ‘MeshWORK’ is Spiral Dynamics co-developer Don Beck’s concept, developed from his work in South Africa. In a nutshell, the concept is to bring all the parties/elements with an interest in the situation together and, using vMEMETIC analysis, work out what needs to be done for the greater good of all, both short-term and long-term. It addresses all issues, taking all viewpoints into account. To have a successful national MeshWORK, every possible fracture point in British society needs to be explored – and the links between the fracture points. Historical events and influences need to be factored in and all future possibilities considered. The wording “what needs to be done” is critical. It’s not about who wants to do what – which is why strong ideological viewpoints – such as May’s, such as Corbyn’s – are inappropriate for a MeshWORK. It’s about pragmatism: what needs to be done, what can be done for the greater good of all. The MeshWORK design process needs to be managed from 2nd Tier thinking…and it may be that some interests may have to be sacrificed for the greater good. The TURQUOISE (Transcendence) vMEME understands this…which is one of the reasons Abraham Maslow talks about the ‘cosmic sadness’ of Transcenders knowing that sometimes some have to be sacrificed; some have to lose out. There is no place for zealots and ideologues in leading the the design of a MeshWORK, though the memes they put out and the effects they have need to taken into consideration. 2nd Tier pragmatists, who can see the value in all views and where those views fit in are what is required. Of course, no one can be entirely free of subjectivity – which is why a MeshWORK needs a representative team who can work together to create vMEMETICALLY-informed perspectives on what needs to be done. As Gregory Bateson (1972) famously wrote: “Knowledge comes from but a single perspective. Wisdom comes from multiple perspectives”. YouGov poll results, published 31 May. With most polls indicating the lead between Labour and the Conservatives has narrowed considerably and several of the latest, such as the YouGov poll left, indicating a hung Parliament is a real possibility, there is an opportunity to move beyond the extremist positions offered by May and Corbyn. A hung Parliament would create the opportunity for the ‘progressive alliance’ Caroline Lucas proposes to be at the heart of a new coalition government concerned with both short-term and long-term sustainable pragmatism for the good of all. The challenge then would be to go beyond the ‘horse-trading’ compromises which usually characterise the formation of coalition governments and reflect 1st Tier thinking. Inevitably, though, there will be some of that. What would be really daring, adventurous and transformatory would be to bring together ‘big picture’ thinkers – eg: Lucas, Farron, Starmer, the SNP’s Angus Robertson – and for them to work on developing new ways of doing politics based on MeshWORK principles, to address the many faultlines undermining the UK’s social cohesion. 8 June: Time for a Change! Online Censorship: where do we draw the Line? In principle, I’d be more than happy to see the sort of coalition of the left/centre left that you describe. If there’s one thing the UK right have been consistently better at over the years then I’d suggest it is putting aside their differences to unite against their opposition. The Tory party is arguable the most successful political machine ever created and holds together a multitude of viewpoints in relative harmony. The left on the other hand, is too often subject to petty squabbles and semantical disagreements. This can be seen in the fractured nature of the political landscape which just isn’t helpful in a first past the post system. However in reality I just cannot see an effective coalition happening. Sturgeon would not (and arguably could not) accept any coalition deal that didn’t promise a second IndyRef which is something Corbyn would not (and indeed could not) accept. Farron has ruled out any coalition and I’d argue that he’s wise to do so rather than risk the kind of backlash the party saw after the 2010-15 coalition. Corbyn won’t give Farron the referendum he’s promised and to compromise such a fundamental manifesto promise would be top up fees all over again. What’s left is such a small number of seats it would be less a coalition and more Labour et al so unlikely to be the moderating influence on Corbyn you are hoping for. In the future, coupled with much needed electoral reform, I hope we do see some of the kind of thinking you are proposing. Coalitions have been shown to work well in governments with more representative elections. But here and now it seems to me very, very unlikely.